1 What are the active ingredients? Researchers have identified that water-soluble polysaccharides are one of the active ingredients found in Red Reishi that have anti-tumour, immune modulating and blood pressure lowering effects. Another active ingredient is triterpenes, a class of them found in Reishi is known as ganoderic acids. Studies have indicated that ganoderic acids help alleviate common allergies by inhibiting histamine release, improve oxygen utilization and improve liver functions. 2. Are there any side-effects? No. According to classical literature, Reishi is classified as a superior herb. Superior herbs are said to be non-toxic and can be consumed in large quantities and for a long period without any side effects. After 2,000 years, there are still no side effects reported in available literature and clinical studies. However, very sensitive individuals may experience some detoxification symptoms such as mild digestive upset, dizziness, sore bones, and skin rashes during the initial period of intake. This is the excretion of accumulated toxic matters from modern day foods and vigorous activities of the body metabolism. These are all normal signs of recovery and an indication that the medicinal effect of Red Reishi is functioning well. These detoxification symptoms will usually go away within a few days of continuous use of Reishi. Taking a source of Vitamin C with Reishi can help reduce any side effects which may occur upon the initial intake of the herb. 3. Can I take Reishi with my other medications? Yes. Reishi is a natural health supplement and there are no reported contraindications in over 2,000 years of study. However, all immune-modulating substances such as Reishi should be taken with care for patients undergoing organ transplants and using immunosuppressive drugs. 4. How soon can one see the results of taking Reishi? Normally one can notice the benefits from taking high quality Reishi after about 10 days to two weeks. One can experience a significant difference with their overall well-being after taking Reishi continuously for two months. It is important for individuals to make Reishi a part of their daily routine for preventative health. 5. Is Reishi good for all age groups? Yes. Reishi is a health food supplement that is useful for all age groups. 6. What are the directions to take Reishi? Reishi is best taken in the morning with an empty stomach. Drinking more water will also help enhance the effects of Reishi by helping the body get rid of poisonous waste. 7. Which Reishi product is right for me? 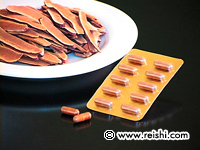 Reishi products are available in tablet, capsule, or granular form. A good Reishi product should be in an extract or essence form (For more about this, see Question 12.). Like any other product, not all Reishi are created equal. Reishi products have different levels of quality depending on the manufacturer. Factors such as the method of cultivation, the quality of the plant’s mother fungi, the growing conditions, and the processing method used to extract the Reishi essence from the Reishi mushroom all play an important role in determining the potency of a Reishi product. As the Japanese are the originators for cultivating Reishi commercially, products from Japan generally use the best cultivation technique called the natural wood log method to cultivate high-grade Reishi. Before deciding on which product to use, also make sure that it is properly and clearly labelled with the ingredients, extract ratio, manufacturer or importer address, and product origin. Any authentic, high-quality, and safe health supplement will contain this information. 8. What are the different types of cultivation for red Reishi? The three most common method of cultivation include wood pulp , wooden box , and natural wood log cultivation. Wood pulp cultivation involves placing wood pulp in a glass bottle with Reishi fungi added. After 3 months, this usually will yield small mushrooms of relatively poor quality. 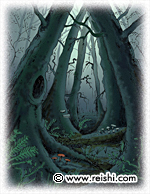 Wood box cultivation involves grafting the fungi into a wooden log which is then placed in a wooden box. Reishi of medium-size and moderate quality are generally produced through this method after 6 months. The natural wood log method, developed first by the Japanese, is the most complex form of cultivation and produces large red Reishi with superior quality. The process involves first culturing high quality Reishi fungi strain in test tubes for about 85 days. Germinating fungi are then placed into drilled holes of selected high grade logs between 26 to 30 years old. The logs are then placed in a greenhouse and buried under nutrient-rich soil for 5 months. During this growing period, the Reishi fungi absorb almost all of the nutrients from the soil. Growing conditions require continual monitoring to ensure a high quality Reishi harvest. Please refer to this website for more detail about natural wood log cultivation process. 9. What is the difference between black Reishi and red Reishi? Only six kinds of Reishi have been studied in greater detail to uncover potential health benefits – red, black, blue, white, yellow and purple Reishi. Of these six types, black and red Reishi have demonstrated the most significant health-enhancing effects, and both are therefore widely used in the global health supplement market today. However, red Reishi has been proven to be the most effective in improving one’s overall health by enhancing the immune system, many bodily functions, and vital organs. 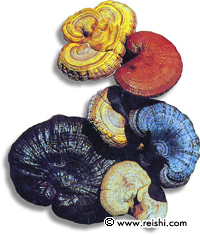 Black Reishi (Ganoderma sinensis), is fairly common and can be found in most Chinese herbal shops. This species of Ganoderma tends to be unevenly shaped and can measure up to ten inches in diameter, although most mature specimens are about six inches in diameter. The majority of Reishi products that claim to be using “wild”. Reishi generally use black Reishi. While it still possesses some value as a moderate herbal tonic, black Reishi is considered to be inferior to red Reishi because of its lower polysaccharide content. 10. Should Reishi be taken only when one is ill? No. Reishi can be taken at any time even when one is not ill. The primary benefit of Reishi is its ability to support and modulate the immune system to an optimal level. 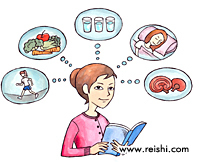 Hence, Reishi is beneficial even for a healthy person. It is best to make red Reishi a part of your daily routine for preventative health. 11. In addition to using red Reishi products, how can I improve my health? Refrain from using refined sugar. Substitute with pure honey or fruit sugar instead. Eat a healthy mix of natural foods from each food group to maintain your nutritional balance. Include all types of vegetables in your diet, especially those with stalks and roots. Drink more water. Try to drink 8 glasses of water a day. This will prevent cellular dehydration and enhance your metabolic functions to rid your body of poisonous waste. 12. How is Reishi Essence extract different from Reishi it its raw form? As raw Reishi itself is hard and not edible, the nutritional value of Reishi in its raw form is low without any further processing. It is difficult for the body to absorb the active ingredients of raw Reishi without any extraction. In Traditional Chinese Medicine (TCM) and throughout its history of use, only fully-grown dried Red Reishi was used, cut into slices, boiled in hot water, and then finally drunk in a tea/soup in order to properly digest the active ingredients. Now Japanese manufacturers of Reishi products use a refined and labour-intensive processing technique where raw Reishi is boiled multiple times at a high pressure and sanitary environment to properly extract the nutritional essence of Reishi (hot-water extraction). Inferior Reishi products in the market place are made only with the pulverized powder from raw Reishi which is not further refined. 13. How is Reishi different from other mushrooms? While mushrooms such as shitake, maitake, and cordyceps, all share similar immune boosting properties, Red Reishi has also the longest history and has been known to be effective in the treatment of the widest range of health conditions. Unlike other mushrooms, only Red Reishi has many important compounds such as triterpenes (ganoderic acid) that gives Reishi its unique characterisic of being bitter in taste. 14. Where does Reishi come from? The Reishi mushroom is found in nature on plum trees. However, it is extremely rare and almost impossible to find in this manner. For this reason, it was deemed as priceless and only consumed by royalty in China and Japan for thousands of years. In the early 1970s, Japanese researchers discovered a method for cultivating Reishi on a mass scale. Now Red Reishi is readily available and can be found cultivated commerically in Japan, China, the US, and other parts of Asia. 15. What are all the benefits of Reishi? The following table was found in a published article titled Medicinal mushrooms: their therapeutic properties and current medical usage with special emphasis on cancer treatments from Cancer Research UK.